BANGALORE, Aug 1 2012 (IPS) - Almitra Patel, a civil engineer by qualification, says she was first alerted to India’s huge problem of inadequate waste disposal when she noticed that the frogs in the marshlands near her farmhouse, on the city’s outskirts, had stopped croaking. Seeing that the frogs had died from sewage and garbage being dumped in the wetlands, she petitioned the Supreme Court in 1996 to intervene and get the city fathers to take responsibility for safe waste handling. Investigations showed that less than half of the sewage produced by this global information technology hub was being managed in modern treatment plants, with the rest ending up as raw, untreated sewage in the city’s lakes and wetlands. Patel won her suit to make the safe disposal of waste a municipal responsibility, but management of solid waste and sewage remains a national problem. “The marshlands (around Bangalore) have now turned into a deep, black stinking river of sewage that flows in an open channel through dense habitation to an expensive power-guzzling treatment plant,” Patel told IPS. Impressed by her work, the court appointed Patel, now 75, as member of a waste management committee tasked to report on conditions countrywide with a view to having a policy formulated. In 2000, India finally framed a solid waste policy based on the committee’s report, requiring all cities to devise comprehensive waste-management programmes that include household collection of segregated waste, recycling and composting – but this was never implemented. The Energy and Resources Institute in New Delhi has estimated that by 2047, waste generation in India’s cities will increase five-fold to touch 260 million tonnes per year. Bangalore’s municipality recently collected funds to clean and conserve its once-splendid wetlands, now shrunk from 262 in 1962 to just 17 in number. But, a study by the Indian Institute of Science, located in this city, says that the built-up area has simultaneously expanded by 466 percent over the same period. “Municipalities are garnering funds for building these power-consumptive plants, but don’t have the money to pay their expensive electric bills, or the infrastructure to bring the sewage to them,” Patel told IPS. “Most such plants are not working”. A report by the non-government organisation, Centre for Science and Environment (CSE), Delhi, based on surveys of wastewater profiles of 71 Indian cities, highlights lack of infrastructure and neglect of sewage with less than 30 percent of the country’s officially recorded sewage being treated in proper facilities. The CSE survey, released earlier this year, shows that 70-80 percent of India’s wastewater was ending up in its rivers and lakes. “We are drowning in our excreta,” Sunita Narain, director of CSE, told IPS. According to the World Health Organisation, more than 87 percent of people in India’s cities (compared with 33 percent in rural areas) now have access to a toilet, but leaking and incomplete sewage systems contaminate rivers and lakes. Currently, some 340 million people live in Indian cities; by 2030 the number is estimated to double, presenting a frightening spectacle of imploding sewage in its cities, several of which suffer water scarcity and pollution problems caused by encroachments into lakes and water bodies. The northwestern city of Ahmedabad has built over 65 of its officially recorded 137 lakes, while the southern city of Hyderabad has a new airport built into the catchment area of Himayat Sagar, a major lake. With recycling of wastewater still a pipe dream in most cities, almost all water is let out into drains that carry untreated sewage and end up in the country’s lakes and rivers. Old pipeline infrastructure has not kept pace with India’s ever expanding cities, resulting in large urban areas being devoid of planned water supply and sewage treatment. The cities of Delhi and Mumbai account for 40 percent of the country’s entire sewage-treatment capacity, leaving other urban settlements with woefully inadequate infrastructure. Inequity of water and sewage disposal infrastructure between rich and poor areas is another phenomenon rife in Indian cities, with high-income zones cornering most of the available amenities. Only five percent of piped water reaches slum areas in 42 cities and towns, including New Delhi, the country’s capital city. And, as freshwater sources dry up, water is increasingly being pumped across great distances, from lakes and rivers into the cities. In Bangalore, the municipality has been increasingly relying on the river Cauvery, 100 km away from the city, and already this is insufficient to meet the city’s demand. 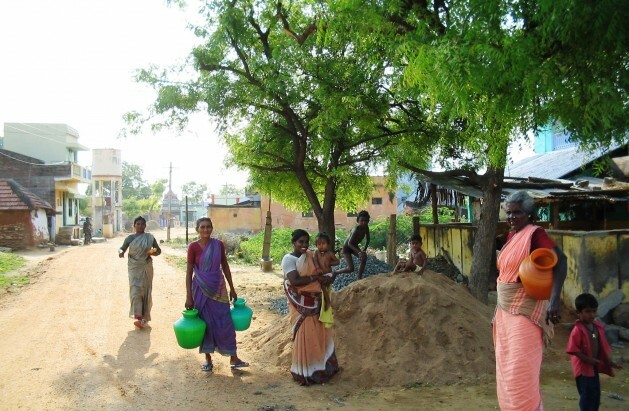 Groundwater, not surprisingly, is now depleting rapidly in many areas as citizens sink more bore wells and authorities are yet to map the consumption of this resource. A survey of groundwater in 27 cities, completed in 2008 by the Central Pollution Control Board (CPCB), had warned that untreated sewage flowing in open drains was causing serious deterioration of groundwater quality. The CPCB then called for proper underground sewage systems to be laid in all inhabited areas and recommended that a proper system of collection and transportation of domestic waste be developed. Carrying water to cities across great distances has resulted in leakages and theft en route as well as conflict with rural communities that are left with insufficient water for their own needs in the rivers and lakes that have served them for generations. Patel states that there are easier and cheaper ways to treat wastes locally. “Surat city’s municipality has been producing its own electricity from sewage gas since 2004. There are solutions,” she said. A lack of adequate sanitation means the human waste often contaminates water supplies, so there is a shortage of potable (safe) water. Thus, many Indians are drinking water containing the viruses, bacterium and parasites found in human waste … so major health problems are created that act to reduce population numbers, The Indians are therefore dying in greater numbers than would otherwise take place.